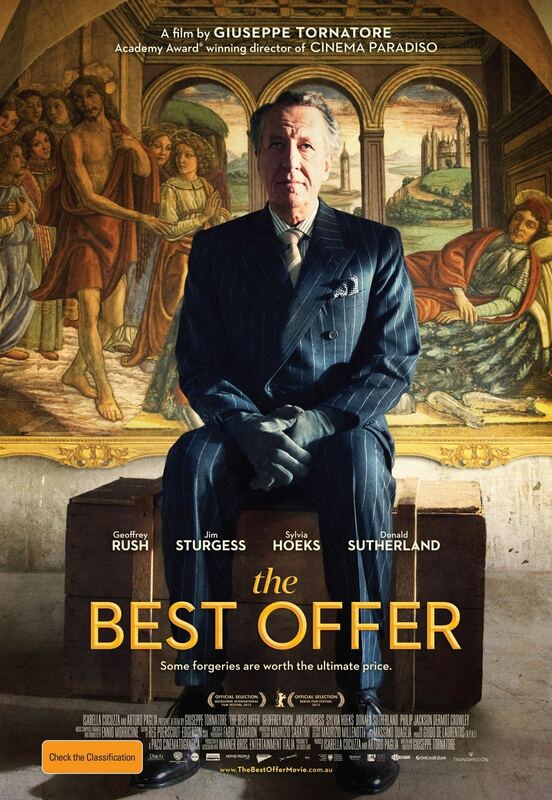 Synopsis: The Best Offer is the tale of the solitary, cultured Virgil Oldman (Geoffrey Rush), no longer young, whose reluctance to engage with others is matched only by the dogged obsessiveness with which he practices his profession of art expert and auctioneer. Asked to handle the valuation and sale of a mysterious woman, Claire Ibbeston’s (Sylvia Hoeks) priceless heirlooms, Virgil finds himself enveloped by a passion that will transform his grey existence forever. Review: The Best Offer is an uneven offering from Giuseppe Tornatore, whose body of work can be best described with the same word – uneven – since the early career success of Cinema Paradiso. Directed and written by Tornatore, The Best Offer is an excellent showcase of Geoffrey Rush’s thespian skills, and is accompanied by great visuals and a lush score (by Ennio Morricone). However, the rest of the cast don’t fare as well as Rush, and the plot is an extremely convoluted one that eventually does itself in with a flurry of hamstrung, too-obvious twists and turns. Geoffrey Rush once again proves to be a brilliant actor, especially since he has to portray two aspects of Virgil – the cold, calculative social misfit before he meets Claire, and the more human and vulnerable old man that he becomes after falling for the largely unseen Claire. His performance does veer into the over-dramatic at times, almost a caricature of a crotchety old eccentric, but overall it’s still a very assured and charismatic performance. Sylvia Hoeks unfortunately disappoints as Claire, and worked better as a disembodied voice in the first half of the movie, than the petulant and quite unlikeable (though still beautiful) woman in the second half. One cannot imagine her being attractive even to a social hermit like Virgil, no matter how much the script tries to force this union. Tornatore also seemed to be unable to practice self-editing, the most evident being a completely baffling subplot with a mechanical automaton that has zero need to be present in the film, except to function as a tool for exposition. The end result is a movie that runs over 2 hours and yet doesn’t justify the running time at all. Over-exposition is the order of the day, and since the finale is so glaringly obvious, the film feels as though it takes forever to reach a foregone conclusion. And yet, so many plot lines are left unexplained that it’s almost frustrating, and the film simply assumes that no one would question the logic (or lack thereof) of the whole venture. The Best Offer is an offer that’s marginally good, at its best – although highly technically proficient, checking all the requisite boxes for what makes a handsome movie, the film falters and stumbles along, despite an intriguing start. It is rescued solely by Rush’s presence, but the most of the goodwill runs out along the way, and the entire film virtually falls apart in its final, rather disappointing reel. Who was the ringleader who stole all of Geoffrey Rush’s paintings ? I believe it is implied that Donald Sutherland masterminded it with almost everyone else in cahoots.